SPRINGFIELD – State Sen. Bill Cunningham is proposing legislation designed to protect homeowners from smoke and noise pollution produced by idling trains on two local railroad lines. Cunningham's proposal was filed after he and other local elected officials received numerous complaints from constituents who live along the CSX Railroad's Blue Island and Elsdon rail lines about air and noise pollution from trains that are often stopped and idling for hours, dozens of feet their from homes. The legislation would allow local municipal and state agencies to fine railroads for the pollution caused by trains that stop near homes and keep their engines running for extended periods of time. "The residents of these neighborhoods are fully aware that living next to railroad tracks means living with the noise of passing freight trains," Cunningham said. "However, they should not have to live with trains that are parked and idling for hours on end, sometimes blocking traffic and often belching diesel fumes and smoke into their homes." The two rail lines in question run through the communities of Evergreen Park, Mount Greenwood, West Beverly and Auburn-Gresham, between Western and Kedzie Avenues. During the past two years, area residents have reported a big increase in the number of times trains stop and idle on stretches of track that cut through densely populated neighborhoods. On many occasions, the trains idle for several hours, sometimes throughout the night, before moving again. The trains rarely turn off their engines while stopped, which means smoke, fumes and noise from their roaring diesel engines fill the surrounding neighborhood. Cunningham has joined with State Representatives Fran Hurley and Kelly Burke, Chicago Aldermen Matt O'Shea and Lona Lane, and Evergreen Park Mayor James Sexton to pressure CSX address numerous problems associated with increased rail traffic in the area. “We view filing legislation as a last resort because we don't want to restrict the rights of a business, but at the very least we want to start a conversation to reach a compromise to end a potential environmental hazard. I look forward to working both with the rail companies and the effected neighborhoods to achieve the best outcome for our community,” Cunningham said. Cunningham’s proposal would ban diesel locomotives from idling for more than 30 minutes within 1,000 feet of a residence, business, school or hospital. A railway that leaves a train idling in these areas for more than 30 minutes would be fined at least $200, and the amount increases the longer the train is left idling. Cunningham filed his initial proposal this week and will continue to pursue the issue when the General Assembly convenes next month. State Senator Bill Cunningham and other area elected officials hosted two in-district outreach events this week. Cunningham and State Rep. Kelly Burke (D-Evergreen Park) hosted a burglary prevention workshop in Evergreen Park on Monday. Local law enforcement officers and a reformed burglar discussed how people can reduce the chances of burglary and educate voters about how to manage the aftermath of a home invasion. Cunningham also hosted a senior resource fair Wednesday with Burke, State Rep. Fran Hurley (D-Chicago) and U.S. Rep. Dan Lipinski (D-Western Springs). The Oak Lawn senior fair brought state, local and private senior programs together under one roof to give out information and answer questions. Health organizations also provided medical screenings for participating seniors. 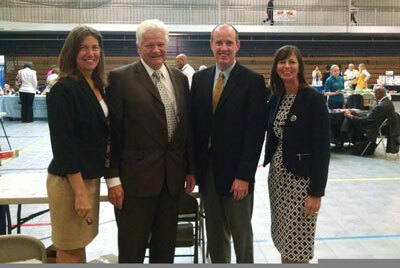 Photo: Hurley, Jerry Mulivill from Congressman Lipinski’s office, Cunningham and Burke at the senior resource fair at the Oak Lawn Community Pavilion on Sept. 17.